If you want to make Chip Kelly sick to his stomach mention anything about the USC job, where his bud, Steve Sarkisian, was dismissed and is addressing what reports say is a substance abuse issue. 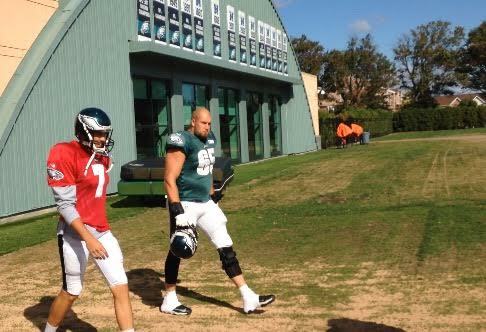 Sam Bradford, Lane Johnson hit Eagles practice field while Chip Kelly addresses coaching rumors. Ask yourself how you would feel when outsiders asked if someone was interested in giving you the job that belongs to your sick friend on indefinite leave of absence. Like Clint Eastwood says, do you feel lucky, punk? These college rumors aren't going to go away because Kelly has a system that not only wins, but on that level wins big. Which is why a wealthy friend of the Texas football program, according to reliable sources, wants Kelly to be the next man in that head coaching job currently occupied by Charlie Strong. The friend, we've been told, hails from the Middle East. Possibly a Prince. Imagine that news conference.